Shun Lee Palace on East 55th street opened in 1971 and originated Chinese fine dining in New York City. It’s original chef T.T. Wang, who previously worked for the Taiwanese Ambassador to the US, introduced General Tso’s Chicken, Hunan Fish and Orange Beef to the U.S. and was also the first to bring Hunan, Yangzhou-Sichuan and Shanghai style cooking to New York City. The New York Times has several interesting articles (one here) about the history of Shun Lee and the restaurant and its owner were featured in the documentary “The Search for General Tso“. Shun Lee West was opened on the West Side in 1981 and was renovated and renamed Shun Lee in 1985. The entrance to Shun Lee is a dark, black-ceiling-ed hallway with the host’s podium ominously framed in silhouette at the end of the hall. Beyond the host there a theatrically styled sunken dining area with dramatic lighting and golden, tongue thrashing dragons flying around the perimeter of the dining space. The Dumplings: the main menu has vegetable steamed dumplings, Shanghai Soup Dumplings, Szechuan boiled dumplings and Beijing style pan-fried pork dumplings, and the dim sum menu is replete with dumpling options. The selection of Shumai includes; Vegetable, Beef, Chicken, Pork and Shrimp, Seafood, and Crab Meat & Shrimp styles and the selection of dumplings includes; Chicken & Mushrooms, Pea Shoot & Shrimp, Vegetable, Har Gau, Seafood with Chives, Scallops, Mixed Mushroom, Pork & Cilantro, Chicken & Spinach, Vegetable Funggar with peanuts, Pork & Chives, and Pan Fried Pork Dumplings. Clearly I will need to return several times to work my way through the dim sum menu. I also need to find out which of the vegetable dumplings are vegan. 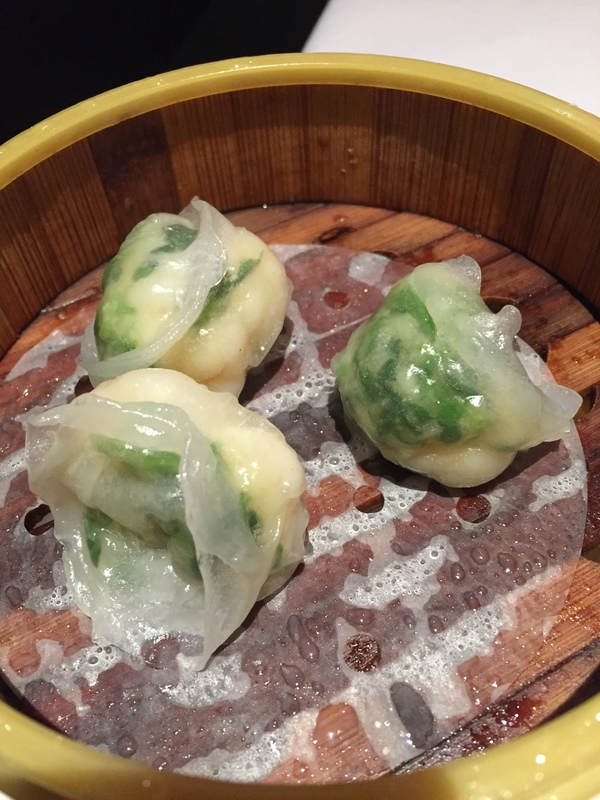 Steamed Pea Shoot and Shrimp Dumplings – these dumplings are on the dim sum menu and come three to an order in a mini steamer. I love pea shoots which are super nutritious, and while these dumplings were great, I think they could have used more pea shoots. I feel the same way about pea vines that The Bruce Dickinson feels about cow bells. The dumplings were filled with big pieces of fresh, sweet meaty shrimp with a sprinkle of pea shoots like a garnish adding a green taste that referenced peas, spinach and watercress. Xiao Long Bao – the soup dumplings at Shun Lee were excellent, filled with fatty pork broth soup and flavorful, silky smooth textured pork. You only get four dumplings per order and they are each served on a Chinese soup spoon, which I really don’t like as a plating strategy. Once removed from the steamer the dumplings cool too fast and the wrappers stiffen up, so you need to eat them fast. Plus this plating seems like a commentary on my chop-stick skills, like they think I don’t have the skills to remove soup dumplings from a steamer. 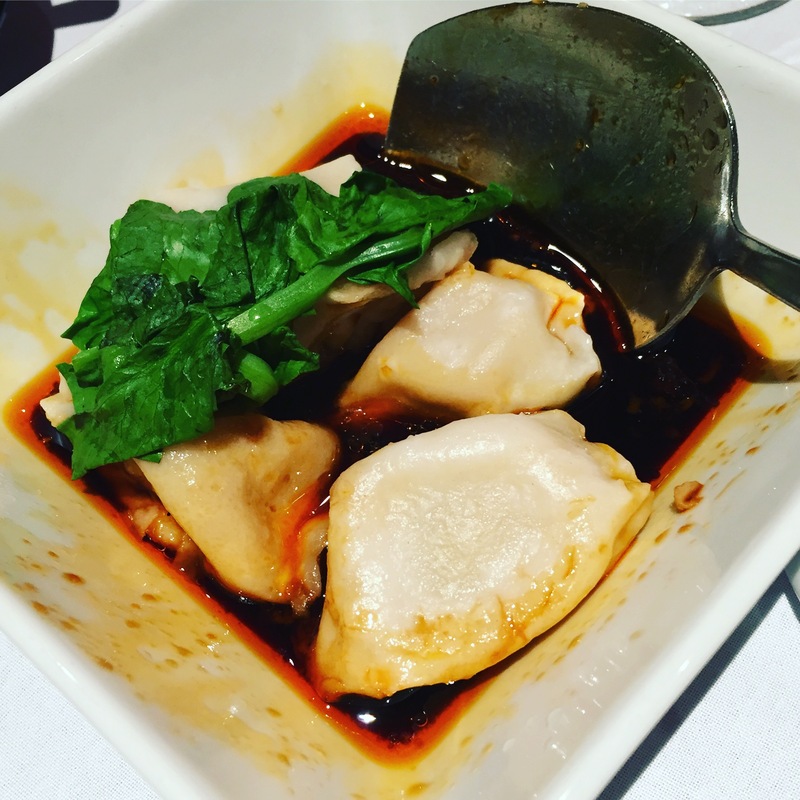 Szechuan Boiled Dumplings – this is probably the best value for money among the dumpling choices, for about the same price as the other dumplings on the main menu, you get eight (instead of four) dumplings in a sauce of chili-oil and soy sauce. Typically this dish uses wontons and the long floppy noodle tails of the wonton wrapper provide extra surface area for the sauce to cling to, but at Shun Lee they use Shui Jiao style boiled pork dumplings. The pork meat ball filling was a little courser ground than the filling of the soup dumplings but tasted just as good. The wrappers were thin and delicate and had a slightly sweet flavor that counterpointed the savory pork. The chili sauce had an initially mild heat that crept up on me as I ate. By the end of the dish my lips and tongue were feeling the burn, although not so bad as to prevent me from slurping down several spoonfuls of the tasty sauce once I ran out of dumplings. 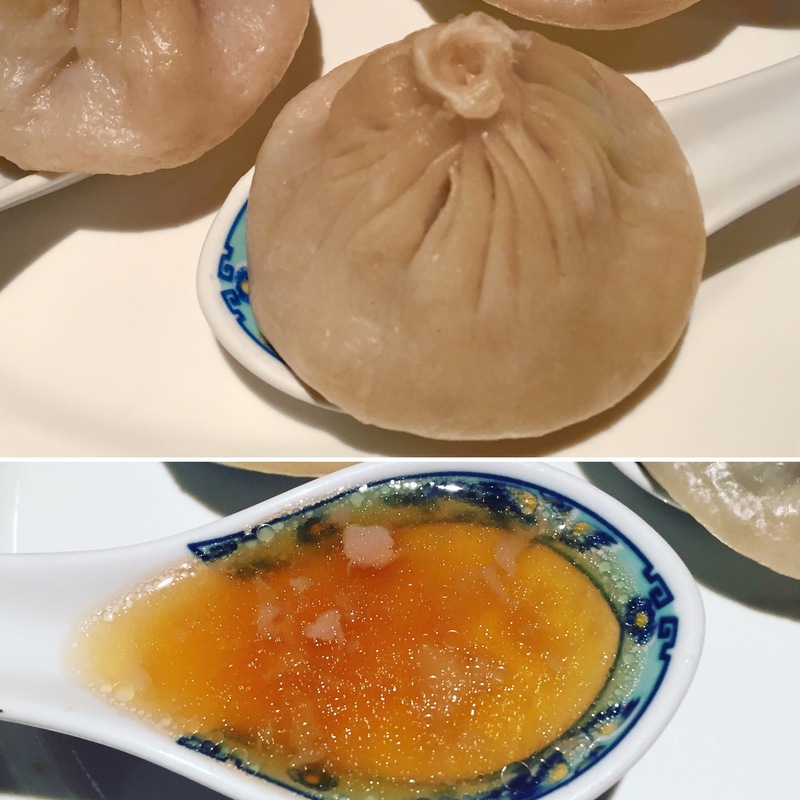 Dipping Sauces: The soup dumplings came with the traditional dipping sauce of black vinegar with slivered ginger. I usually do not like this sauce as I find it too intense, but at Shun Lee they cut the vinegar with something so it was lighter and less intense than usual. The sauce that came with the Shrimp and Pea Shoot dumplings was a nasty brown gloppy sauce with chopped garlic in it. Location: Shun Lee is on 65th street just East of Broadway in the Lincoln Center section of the Upper West Side of New York City. It is an easy walk from the A/C/B/D/1 trains stop at Columbus Circle and a block and a half from Central park. This entry was posted in Pork, Shrimp, Sichuan Dumplings, Soup Dumpling, Steamed. Bookmark the permalink.